Description: This course is an introduction to the stock market and stock investing for novices and experienced investors alike. 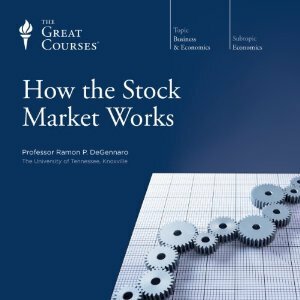 Professor DeGennaro uses simple analogies to explain the origin of stocks and other securities, as well as their relative risks. He stresses the danger of trying to beat the market by trying to pick winners, predict price trends, or otherwise find opportunities that other investors have missed. Far better, he counsels, to own a well-diversified portfolio of individual stocks or stock funds, which tend to grow as the economy grows. He offers detailed guidance on how to pursue this course. A good starting place before you begin investing. This is a lecture series by the Great Courses which I’m going to revisit at least once. Instead of telling you the ‘how’ of investing, DeGennaro gives you the lingo you need to know before you can become a good investor. For example, he tells you what ‘short selling’ is, what ‘bonds’ are, what ‘401(k)s’ are, and more. Highly recommended if you want to learn more about financial planning and the stock market. The speaker is never overbearing, and he deliberately goes out of his way to be simple. If you are a more advanced listener this will probably be too simple for you, but for me this is a good stepping stone for greater things.